Fowl Behavior: Chicks are cute, but are they worth the extra work? Chicks are cute, but are they worth the extra work? Little kids and baby chicks go together like bacon & eggs. My friend Denali is raising two dozen chicks who are growing rapidly. She must monitor their temperature, water, environment and food several times a day and keep them separate from her flock of older hens. If full-grown hens do not raise the chicks, they may go so far as to cannibalize young chicks. They can't help it -- it's instinctive. It's fun to visit her her chicks and see their growth, but I'm happy to buy pullets, adolescent chickens about 6 months old who are ready to lay or crow depending on their gender. 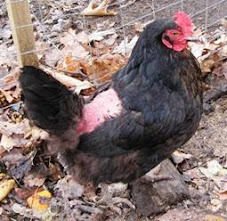 Pullets can be had for about $10, roughly the cost of feeding them for the first six months. I've already raised four children. Maybe in a few years I'll be ready to take on the responsibility and work of raising newly hatched chicks. 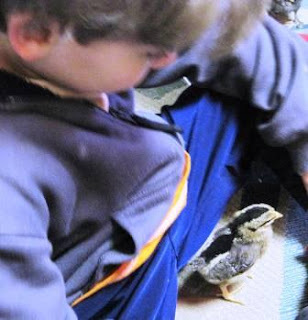 Chicken friends are essential to backyard chicken keepers because you help each other with knowledge, chicken care and by adopting each others' excess birds. I've inherited several birds that way -- once they're mature enough to join my flock's pecking order.